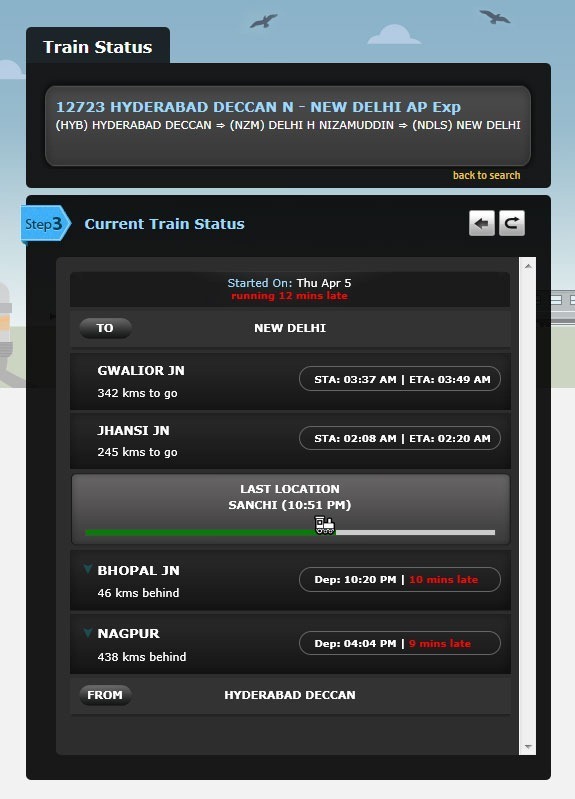 The new train enquiry website of Indian Railways offers the live running status of trains and you can also track the location of trains online. The Indian Railways operates nearly 11,000 trains everyday and you can use their website – trainenquiry.com – to know the current running status of any train. You can either enter the the name of the train, or the train number if you remember it, and the system will tell you whether that particular train is delayed or running on time. That’s good to know but where exactly is your train? There are plenty of new features to appreciate about the new website. You no longer have to remember train numbers – just enter any two station names (like Delhi to Hyderabad) and it will bring all the trains available on that route. The Indian Railways website is using AJAX probably for the first time and thus you get search results as you type which is very handy. Once you spot your train in the search results, you can learn about the train’s departure time at the previous two stations that the train has crossed, how far are the next two stations on the route and what’s the expected time of arrival at these stops. All these details will help you better plan your visit to the station. The new website should go live in the next few weeks but if you would like to try it right now, go trainenquiry.com/searchtrain.aspx and choose the New Look option. It’s still in beta so you may encounter a few bugs but great effort overall. The website is not exactly mobile-friendly at this time but you get the details on a mobile as well. Also, I think it would be more useful if the same information could be visually presented on a Google Map.